This article is about the fictional planet. For the city in Tunisia, see Tataouine. For the real planets that are sometimes referred to as "Tatooine", see Circumbinary planet. Tatooine (/ˌtætuˈiːn/) is a fictional desert planet that appears in the Star Wars space opera franchise. It is beige-coloured and is depicted as a remote, desolate world orbiting a pair of binary stars, and inhabited by human settlers and a variety of other life forms. The planet was first seen in the original 1977 film Star Wars, and has to date featured in a total of six Star Wars theatrical films. It is noted as the home planet of the protagonist of the Star Wars saga, Luke Skywalker, and also of his father, Anakin Skywalker. Shots of the binary sunset over the Tatooine desert are considered to be an iconic image of the film series. In his early drafts of the Star Wars story, author George Lucas changed the names of planets and characters several times. In his early treatment, Lucas opened the story on the fourth moon of the planet Utapau, the home of a young warrior called Annikin Starkiller. In Lucas's rough draft, The Star Wars (1974), the escaping droids land in a desert on the planet Aquilae; in later drafts the planet again takes the name of Utapau. Prior to production, early artwork commissioned by Lucas from conceptual illustrator Ralph McQuarrie show robots lost on a desert world, scorched by twin suns and mysterious, masked Tusken Raiders riding large horned Banthas. George Lucas originally envisaged filming the Utapau/Tatooine scenes in Algeria (inspired by Michelangelo Antonioni's 1975 film The Passenger), Libya or Iran, but these locations were rejected by 20th Century Fox. When production began on Star Wars, production designers John Barry and Robert Watts scouted for filming locations in Morocco and Tunisia. Lucas, accompanied by producer Gary Kurtz visited the Tunisian Island of Djerba with them and were impressed by the desert landscape and the unusual architecture, and selected Tunisia to provide the desert planet setting. Lucas was also keen to shoot at the Hotel Sidi Driss in Matmata, a decision which extended the shoot by a day and consequently the budget. Filming in Tunisia began on 22 March 1976 and immediately ran into difficulty: the region was experiencing its first heavy rainfall in seven years, which disrupted the setting of an arid desert planet. The Matmata hotel consisted of a troglodyte dwelling in a large hole in the ground. Combined with shots at Chott el Djerid, near Nefta, this formed the setting for the Lars homestead and moisture farm. The landing site for C-3PO and R2-D2's escape pod was filmed in sand dunes at La Grande Dune, near Nefta, and exterior shots of Mos Eisley spaceport were shot on Djerba. The name Tatooine is not actually mentioned in the final screenplay of Star Wars — Lucas was still working on his fourth draft while scouting locations, and adapted the name from a town in southern Tunisia called Tataouine (French spelling, or Tatween spelling in Tunisian Arabic). Certain scenes filmed on Djerba were subsequently deleted from the final cut of the film in order to improve the narrative pace. The most significant material cut was a series of scenes set in the township of Anchorhead which served to introduce the characters of Luke Skywalker and Biggs Darklighter. Lucas asked film editor Richard Chew to cut these scenes as they had been likened to "American Graffiti in outer space" by Fox executives (in reference to Lucas's 1973 film). Footage filmed at Sidi Bouhlel in Tunisia was combined with 1977 second unit filming at Death Valley National Park in California was used to create the rocky canyon scenes featuring Jawas and Tusken Raiders. 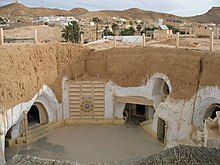 When crews returned to Tunisia to film for the Star Wars prequel films in 1998, locations at Onk Jemal in Tozeur, Ksar Ouled Soltane and Ksar Hadada, Ghoumrassen were used for Tatooine scenes. Abandoned sets for the filming have been left in the desert. Tatooine originally featured in the 1977 film Star Wars, and was the first planet to be seen in the film franchise. In the opening scene, the planet and two of its moons are seen in space against a sea of stars, forming the backdrop of a space battle which sets in motion the events of the film. Two robots, C-3PO and R2-D2, jettison in an escape pod from a captured spaceship, the Tantive IV, and crash land on the surface of Tatooine. The droids lose their way in a sparse desert and are captured by small scavenger creatures called Jawas. When the robots are sold on to human settlers, protagonist Luke Skywalker is introduced as a young man living with his aunt and uncle on a farm. The hostility of the arid desert environment is emphasised by the depiction of sandstorms and the heat of the binary stars, as Luke watches a twin sunset over the sand dunes. 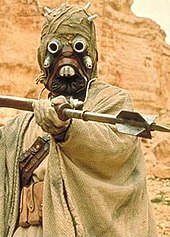 Humans are constantly threatened by violent bandit creatures called Tusken Raiders. As the film progresses, various leading characters are introduced to the story in scenes set on Tatooine: Obi-Wan Kenobi, Han Solo and Chewbacca. Later Tatooine scenes take place in Mos Eisley, a gritty bustling spaceport on the planet which is a centre of smuggling and organised crime. One of the most celebrated scenes in the Star Wars saga is in the Mos Eisley cantina, a shady saloon populated by exotic alien species. Composer John Williams wrote music for the alien band in this scene in the style of swing musician Benny Goodman, and arranged with unusual instrumentation to convey an other-worldly sound. Tatooine features once again in the 1983 film Return of the Jedi, in which the story's heroes return to Tatooine to rescue Han Solo from Jabba the Hutt, a fearsome gangster who dominates the criminal underworld on Tatooine. When the prequel trilogy revived the film franchise in 1999, the action returned to Tatooine for Episode I: The Phantom Menace as the setting for the childhood of Luke's father, Anakin Skywalker. Living as a slave in another spaceport, Mos Espa, Anakin competes in pod races, long-distance airborne races across the desert. The Jedi master Qui-Gon Jinn meets Anakin after making an emergency landing on the planet, and helps him win his freedom. In Episode II: Attack of the Clones (2002), an older Anakin returns to Tatooine to search for his mother, Shmi, who has been kidnapped by Tusken Raiders. The prequels depict a vast expanse of desert with jagged rock formations. Tatooine features once more in the final prequel film, Episode III: Revenge of the Sith (2005); in the closing scene, Obi-Wan Kenobi takes the infant Luke Skywalker into hiding with his adoptive parents on the Tatooine moisture farm. Located in the galaxy's desolate Outer Rim, Tatooine orbits a pair of binary G-type stars, Tatoo I and Tatoo II. The planet's indigenous lifeforms such as the womp rat, bantha, Sarlacc, and Krayt dragon are well-adapted to its arid climate. Though its proximity to the suns makes life difficult, it is located near key hyperspace routes, making it a smuggler and gangster haven; debris from shipwrecks also provides resources for scavengers. Annual sandstorms wipe out landmarks and make nomadic life dangerous, with the planet's populations clustered into distinct settlements. A small Imperial presence brings the planet an additional source of water, its most precious commodity. Though tasked to enforce the law, stormtroopers often overlook crime; an efficient black market also enables the procurement of illegal goods. Human settlers often become moisture farmers and live in subterranean dwellings in order to survive. Pipe systems distribute most of the harvested moisture to indoor crops supplying food for the farmers. Rare water sources such as springs in badlands (e.g. Beggar's Canyon) provide hydration for hermits and Tusken Raiders. The planet is dominated by the Hutts, a clan of gangsters and crime lords. Since Tatooine was beyond the reach of the Galactic Republic, the Hutts presided over the lawless planet with little outside interference. When the Galactic Empire subsumed the Old Republic, the new regime established only a token presence on Tatooine, which left Jabba the Hutt's reign unchallenged until his death during the events depicted in Return of the Jedi. The planet gained notability in the galaxy as the homeworld of Luke Skywalker. Because Tatooine features so prominently in the Star Wars film series, a wide range of locations has been represented on-screen. Although the planet is sparsely populated, settlements of varying size have provided the settings for many scenes in Star Wars films. The first settlement to be shown, is Anchorhead, where many humans settlers on Tatooine pursue a difficult agrarian existence on remote "moisture farms" in the desert, collecting water vapor from the atmosphere to grow crops. Among these moisture farmers is the young hero of the film, Luke Skywalker, who resides with his Uncle Owen and Aunt Beru at the Lars Homestead. The region is dangerous, with kidnappings by Tusken Raiders being a major problem, as shown in Attack of the Clones (2002), when Luke's father Anakin, lost his mother to Tusken Raiders. In the original film, Luke also mentions Tosche Station (or Toshi Station), which was a mechanical repair shop featured in scenes that were deleted from the final cut of the original 1977 film. In the deleted scenes, Luke meets his young friends and bids farewell to Biggs Darklighter, who is about to leave to the Imperial Academy. The Jedi Obi-Wan Kenobi is also exiled near that region, although his house is remote from other houses, as he is hiding under the alias Ben. Bestine is the "capital" of Tatooine; although it does not appear in any films, it is mentioned as "Bestine township" in the 1976 novelisation Star Wars: From the Adventures of Luke Skywalker and is featured prominently in Star Wars Galaxies video games. In the Expanded Universe, there is also a separate planet named Bestine. Mos Eisley (Star Wars, 1977) is the planet's biggest city: a bustling spaceport with an active criminal underworld, described by Obi-Wan Kenobi a "wretched hive of scum and villainy." This is the location of one of the most noted scenes in Star Wars, the Mos Eisley cantina, which is shown as a busy saloon bar-style establishment, patronised by exotic and often violent alien species. The Cantina additionally features as a location in Lego Star Wars video games. Mos Espa (The Phantom Menace, 1999) is home to the Boonta Eve Classic podrace track. Anakin Skywalker spent his childhood in the city, along his mother Shmi; both were slaves under the ownership of Watto. Anakin became the first human to win the race and earned his freedom in the process, due to a bet between Watto and Jedi Qui-Gon Jinn. The city's depiction in The Phantom Menace was intended to look larger than what was seen of Mos Eisley in the original Star Wars. Tatooine is mostly a desert environment. Characters in the films make reference to the deserts by name: the Jundland Wastes, a rocky region, is the location of the Tusken Raider attack in Star Wars (1977), and the neighboring Dune Sea (the basin of an ancient ocean) is the setting for Jabba the Hutt's Palace. Also situated in the Dune Sea is the Great Pit of Carkoon, the lair of the deadly omnivorous Sarlacc creature. The discovery of exoplanets in the real universe gained pace in the early 21st century. In 2015, the US space agency NASA published an article which stated that many of the newly discovered astronomical bodies possessed scientifically confirmed properties that are similar to planets in the fictional Star Wars universe. Among them, the planets Kepler-16b and Kepler-453b have been likened to Tatooine because they have been discovered orbiting binary star systems. ^ Bainbridge, William Sims. Star Worlds: Freedom Versus Control in Online Gameworlds. University of Michigan Press. pp. 79–80. ISBN 9780472053285. Retrieved 9 May 2017. ^ Kaye, Don (13 November 2014). "30 Best 'Star Wars' Moments: November 13, 2014 More News Miley Cyrus' 10 Biggest Scandals 'Blade Runner 2049': Everything We Know So Far 'Guardians of the Galaxy 2': Why Marvel's Misfit-Filmmaker Gamble Works Watch Spider-Man Reveal Superhero Identity in 'Homecoming' Clip Terrifying New 'It' Trailer Sees Losers' Club Journey Into Sewers All Stories 30. Luke and the Binary Suns ('A New Hope')". Rolling Stone. Retrieved 9 May 2017. ^ Bouzereau 1998, pp. 7–8. ^ Bouzereau 1998, p. 17. ^ Hearn 2005, pp. 87–92. ^ Titelman 1979, p. 46. ^ Hearn 2005, p. 102. ^ Hearn 2005, p. 116. ^ a b Daniel Jacobs and Peter Morris (2001). "Jedi Stomping Ground". Tunisia (6th ed.). London: Rough Guides. p. 319. ISBN 9781858287485. Retrieved 9 May 2017. ^ "The Dunes". Star Wars locations. Retrieved 9 May 2017. ^ Rinzler, J. W. The Making of Star Wars: The Definitive Story Behind the Original Film. Ebury Press. p. 99. ISBN 9780091924997. Retrieved 9 May 2017. ^ Taraldsvik, Morten Schive. "Star Wars IV: A New Hope: Lost Scenes". A Sci-Fi Movie Lexicon III. Lulu. ISBN 9781445264653. Retrieved April 23, 2015. ^ "Star Wars trek: Death Valley - April 2001". Star Wars Locations. Retrieved 9 May 2017. ^ "Star Wars: The Abandoned Movie Set". Stuttgarter Zeitung. Archived from the original on 19 April 2013. Retrieved 9 May 2017. ^ a b c d "Tatooine". StarWars.com. Lucasfilm. Archived from the original on 3 February 2017. Retrieved 9 May 2017. ^ a b Wallace, Kolins & McKinney 1998, pp. 176–77. ^ Bartkowiak, Mathew J. Sounds of the Future: Essays on Music in Science Fiction Film. McFarland. p. 91. ISBN 9780786456505. Retrieved 9 May 2017. ^ a b Anderson 1995, p. 15. ^ Anderson 1995, pp. 17–8. ^ Anderson 1995, pp. 20–1. ^ Anderson 1995, p. 14. ^ Whitmer, Benjamin. Star Wars Trivia: Behind The Scenes Stories, Myths, And Amusing Facts. Benjamin Whitmer. Retrieved 10 May 2017. ^ Wallace, Kolins & McKinney 1998, pp. 40–41. ^ a b Anderson 1995, p. 16. ^ Wallace, Kolins & McKinney 1998, pp. 176–7. ^ Bouzereau, Laurent; Duncan, Jody (1999). The Making of Star Wars: The Phantom Menace. Ballantine. p. 15. ISBN 0-345-43111-1. ^ Stephen J. Sansweet, Star Wars Encyclopedia (New York: Del Rey, 1998), p. 258, ISBN 0-345-40227-8. ^ Brennan, Pat; Clavin, Whitney (December 15, 2015). "Meanwhile, in a galaxy not so far, far away..." NASA. Retrieved December 15, 2015. Brooker, Will (2009). BFI Film Classics: Star Wars. Palgrave Macmillan. ISBN 1844575543. Retrieved April 24, 2015. Titelman, Carol (1979). The Art of Star Wars (1st ed.). London: Ballantine Books. pp. 27–46. ISBN 9781852865832. Vaz, Mark Cotta (2002). The Art of Star Wars: Episode II – Attack of the Clones (1st ed.). New York: Ballantine Publ. Group. ISBN 9780345431257. Wallace, Daniel; Kolins, Scott; McKinney, Brandon (1998). Star Wars : the Essential Guide to Planets and Moons (1st ed.). New York: Ballantine Pub. Group. ISBN 9780345420688. Wikimedia Commons has media related to Tatooine.